About A.D. 500, there was a change in the Dorset way of life. Settlements became more numerous in many areas, and the Dorset people expanded to occupy parts of the Central Arctic and the High Arctic that appear to have been abandoned for many generations. New styles of artifacts began to appear, and the uniformity of these artifacts indicates widespread travel and communication throughout the Dorset world. This was the beginning of the period archaeologists refer to as Late Dorset, an era which is as fascinating as it is difficult to understand. The Late Dorset people carved many more small figures and ritual objects than their ancestors had used, and at some sites there are more carvings than necessary objects such as harpoon heads and knives. The majority of the carvings in this exhibit were excavated from Late Dorset settlements. As we will see in the following section, the Late Dorset people seem to have experienced environmental and social stress during this period. Perhaps the florescence of art, and probably of the religious and magical activities with which the art was associated, can be interpreted as a response to the new dangers the Dorset world was facing. Another remarkable feature of the Late Dorset period was the building of large stone "longhouses," elongated rectangular structures outlined by large boulders or vertically braced slabs of rock. Most are six to seven metres wide, and they range in length from ten to forty-five metres. The walls are generally about one metre high and seem to have served as symbolic walls rather than walls designed to provide protection or support a roof. In fact, Dorset longhouses might be better thought of as enclosures than as houses. Perhaps the tents of individual families were set up within the enclosures, which provided a symbolic boundary to mark the communal ties between the families of a local band. The preparation of food also seems to have been a communal activity at longhouse settlements. Rows of cooking hearths are found outside the enclosures, often built in a long line paved with slabs. Sometimes these rows are directly against an exterior wall of the longhouse, and sometimes the hearths are at some distance from the main structure but in a line equal in length to the enclosure. The ruins of Dorset longhouse enclosures are among the most impressive archaeological remains in Arctic regions. They lie abandoned on isolated beaches, their rows of cooking hearths washed clean of charcoal and ash, surrounded by scatters of animal bones and tiny carvings. As places of communal celebration, or perhaps as places where local bands could assemble in times of crisis, the huge structures that dot the beaches of Arctic Canada must have been powerful symbols in the cultures of small Dorset communities. 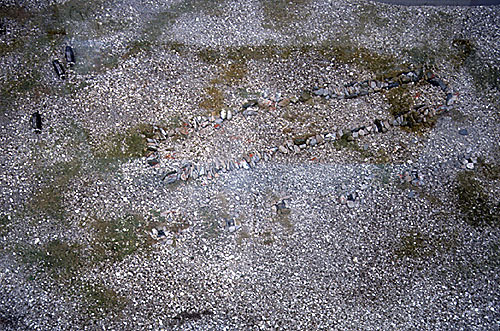 The model in this area depicts the remains of a longhouse structure found on the coast of Victoria Island, in the Central Arctic. hunters, and they furnished the rivers with fish-weirs."